​From Romeo and Juliet by Gounod. Archival Recording Montgomery Sysmphony (Alabama) Thomas Hinds, Conductor from Opera Gala evening with Arietha Lockhart, Soprano. From The Creation by Haydn. Michael O'Neal Singers CD "Highlights from the Creation" Dr. Michael O'Neal, Conductor. Used with Permission. Queen of the night's first aria. Pianist, Daniel Solberg, Solberg Studios. 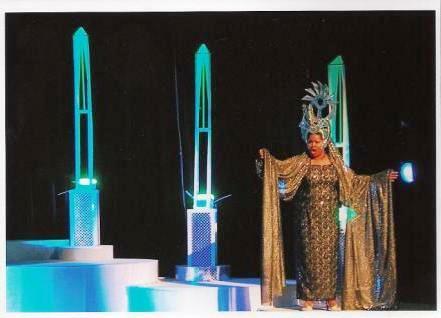 Photo: Ulises Athanasiadis, Tenor Arietha Lockhart, Soprano during Opera Panama rehearsal for Magic Flute. "Willow Song" from Ballad of Baby Doe by Douglas Moore. Archival recording from AYSC and Arietha Lockhart, Soprano concert. Pianist is Sandra Lutters. Archival Recording from a live performance in recital. Sandra Lutters, Pianist. From Brentano Songs by Richard Strauss. Sandra Lutters, pianist. Archival Recording from Arietha Lockhart, Soprano in Recital at Spivey Hall. My solo track from James Cocherham's cd BASIC/Cockerham: Nobody Like Jesus. James is a gifted composer arranger. Looking for a great song to record he has many contemporary gospel pieces available even Gospel rap. He's all about the WORD. Many use this song during the advent season. Plans are being made to create a one-woman show with Arietha Lockhart singing the spiritual arrangements of Mr. Cockerham. From Exultate Jubilate a motet by Mozart. Organ: Robert Thompson. From Live recording at First Christian Church, Atlanta. Timothy Spraggins, Minister of Music. From Lakme' by Leo Delibes. Archival Recording Montgomery Symphony (Alabama) Thomas Hinds, Conductor from Opera Gala evening with Arietha Lockhart, Soprano. From Porgy and Bess by Gershwin. Dekalb Symphony Orchestra, Thomas Anderson, Conductor. Archival Recording of encore by Soprano, Arietha Lockhart. The other selection sung by Ms. Lockhart on the program was "Knoxville, Summer of 1915" by Barber. By Curtis Bryant. THE LAUGHING MONKEYS OF GRAVITY is a four-part song cycle based on a lyric meditation on comedy and loneliness; it is the title poem in a volume by poet Stephen Bluestone. The main characters in the meditation are movie comedians Laughing Monkeys - book cover from an earlier era: Laurel and Hardy, Charlie Chaplin, the Three Stooges, Buster Keaton, Lou Costello, Harold Lloyd, and others. In their moments of loneliness, these comedians salvage the dignity of the human spirit and affirm the will to endure. He tailored the vocal writing to the extroadinary voice of soprano Arietha Lockhart who premiered the set on an all-Bryant/Bluestone concert in 2003 at Fickling Hall on the Mercer University campus. Lockhart was joined by Kelly Via, flute; Monty Cole, clarinet & sax; Giselle Hillyer, violin; Barbara Altman, cello; Brian Nozny, percussion and Roger McVey, piano. Samuel Barber's work for Soprano and Orchestra. Conductor Porter Stokes with the Augusta Symphony Orchestra. From Recital at Spivey Hall. Pianist Sandra Lutters. Artsong. Pianist Sandra Lutters. Decicated to Steve Blier my first coach at Chatauqua. Encouraged me and taught me love the French Artsong repertoire. Contemporary Art Song by James Cockerham- a single from album "Be Still and Know"